I have been writing The Rug Cleaning Specialist for 15 years, and every year another crop of new cleaners dip their toes into the industry waters, so if you long-time readers will bear with me, over the next year we will take a look at some rug cleaning basics. I have been writing The Rug Cleaning Specialist for 15 years, and have appreciated all of your comments and support. Every year another crop of new cleaners dip their toes into the industry waters, so if you long-time readers will bear with me, over the next year we will take a look at some rug cleaning basics. However, before heading off to clean a rug, let’s look at the industry and see what has changed over the last decade and a half. Rugs as a percentage of total soft-surface sales back when this column began were about 11%. Recent statistics show rugs currently make up more than 25% of today’s sales. With newer homes having more hard surface flooring than in years past, sales in these two industries have complemented one another. Recognizing this trend, rug manufacturers have produced rugs with modern colors and with new uses of natural fibers. At the same time, the price point for entry-level rugs has also decreased. Mass appeal of these newer rugs translates into higher unit growth and, as a result, more business for rug cleaners. What has also changed is a flood of innovations from manufacturers of rug cleaning equipment and chemicals. We now have portable rug dusters replacing in-plant fixed devices. Centrifuges spin dry rugs rather than relying solely on compression wringers. 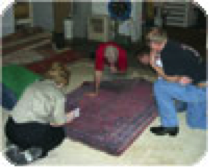 There are now proven systems for urine decontamination and ways to remove dye bleed from high-value rugs. All of this is to help the rug cleaning specialist deal with the ever increasing complexity of fibers and rug construction which is presently in the market. Sixty years ago, rug cleaning was not as challenging as it is today. Rugs then were, for the most part, well made hand-knotted rugs or a bit of Wilton or Axminster woven carpet fabricated into an area rug. Today we see everything under the sun made into a “designer rug” including regenerated fibers like rayon (or viscous), bamboo, soya, and “art silk,” which do not have sufficient resiliency for heavy foot traffic, resulting in pile distortion issues. This can include poor-quality silk rugs with similar issues. These designer rugs are not inexpensive and can potentially present a huge liability for a cleaner, novice or experienced. Another interesting development in the industry is the willingness of established rug cleaning companies to share knowledge obtained over the generations. In the past it seemed these “closely held trade secretes” were not revealed out of fear of competition. Today it is possible to receive good instruction or improve your skills with advanced training and comprehensive reference books. 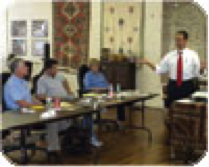 These include one day manufacturers’ introductory classes; the 2-day IICRC Rug Cleaning Technician class; and the 6-day Master Rug Cleaner program. Cleaning rugs in a home or business should be the exception, not the rule. It is just not possible to finish the fringe, correct potential problem, dust the rug properly, etc. So the next item to put in your budget is a rug cleaning facility. In the beginning it could be in your garage or a rented facility of 1,200 square feet or so. Possibly it involves moving to a larger location due the growth of your rug-cleaning business. Whatever you do – no on-location cleaning of rugs! Sit down with your insurance agent and be certain you are adequately insured for this new venture. Yes, you are cleaning textiles, but also you are now storing them in your facility and transporting them. Explain to your agent what you are doing and get their advice. One of the most over looked steps in the process of adding a new service is determining how this will fit into your current business and marketing plans. Diversification should not cause your core business to suffer. Ask yourself, is your business well managed now? Rugs should be integrated into your marketing plan without diluting current efforts. Do not try to be all things to everyone – be a master of the services you offer.